Al igual que las insignias anteriores, puede mostrar cuatro a su eleccion en su perfil, seleccionándolas en el menú "logro" . 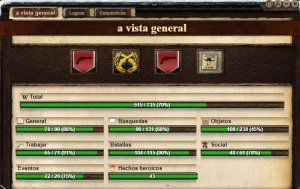 Todo el logro disponibles se listan a continuación de acuerdo a las mismas categorías que en el juego ( se han añadido mas categorias para facilitar su búsqueda). Para saber dónde se encuentra el logro, puede visitar la página logro y en la pestaña '"a vista general' . A continuación, tendrá un resumen y una barra de progreso general, así como para cada categoría. AquariusCompletada la tercera parte de la historia principal "Llamada a la aventura". Successfully Completa the questline "Magic World". Colecciona todos regular and special riding animals. Colecciona todos wide brim hats. Colecciona todos Wild leather hats. Colecciona todos gem leather bands. Colecciona todos heart of the prairie collars. Colecciona todos modified breech loaders. Colecciona todos modified percussion rifles. Colecciona todos double barrel shotguns. Colecciona todos single shot rifles. Colecciona todos Wild leather jackets. Successfully Completa the questline "The easter egg". Successfully Completa the questline "A holiday spook". Successfully Completa the questline "Attack of the Wogons". Successfully Completa the quest line "Christopher's parade". Successfully Completa the quest line "A pawful of kittens". Successfully Completa the quest line "Labor Day". Successfully Completa the quest group "A Western nightmare". Successfully Completa the quest group "The perfect heist". Successfully Completa the quest line "New Year's Eve". Successfully Completa the quest line "Gold Rush". Players on your world collected a significant amount of Cempasúchils during the Day of the Dead Event. Players on your world sent a significant amount of hearts to each other during the Valentine's Day Event. Successfully Completa the quest group "Giant of the land"
Successfully Completa the quest group "Giant of the ocean"
Players on your world collected a significant amount of Cempasúchils during the 2015 Day of the Dead Event. Players on your world sent a significant amount of hearts to each other during the 2016 Valentine's Day Event. Players on your world sent a significant amount of hearts to each other during the 2017 Valentine's Day Event. Cempasúchils everywhere! Orange is everywhere!